Moving is stressful no doubt about it, but did you know it’s up there with job loss, marriage, divorce and death? I have moved a lot, but that’s what happens when you have wanderlust, and most of that moving was done with dogs and cats in tow. Yes they were usually seniors!! I’ve moved apartments in the same city, moved to different countries and even continents. Needless to say I’ve learned a few things along the way, so I thought I’d share my words of wisdom. Naturally I’m focusing on senior dogs as I write, but these tips will work no matter how old or what type of pet you share your life with. I find it incredible how animals have an uncanny ability to sense when something is up, and I have witnessed it enough times that I know it to be true. What’s most amazing to me is how they seem to know you’re going to move even when it’s just an idea…before the M word has even been uttered. I don’t even have to bring a box into the house for them to start acting all weird! I’d like to think I’m being a bit melodramatic, but as moving day nears it’s not an uncommon scenario. Yes it would be great if schedules could be followed, but that’s not entirely realistic so the only thing we can do is the best we can do. Don’t beat yourself up, you’re doing a great job. The good news is there are ways to minimise a move’s effect on our animals, which I believe to be particularly important if they are elderly and/or have anxiety or other health issues. 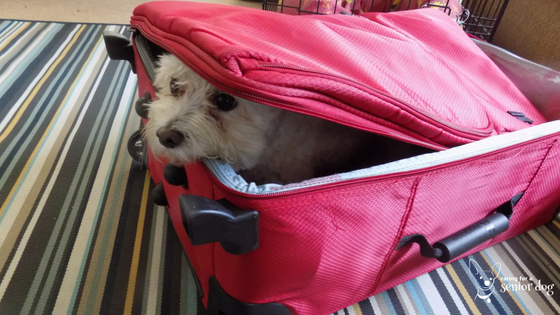 Get your dog used to seeing boxes and suitcases a good couple of weeks before you’ll start packing them, by leaving them out for him to explore. If possible bring them in one or two at a time. Don’t make a big deal about them, and when he starts to sniff around and he’s calm reward him with a favourite treat. It will get him used to seeing them before the commotion starts. Have a support system. Make arrangements for your dog’s care when you’re too busy or you need to get him out of the house because potential buyers will be dropping by. Ask friends, family and neighbours if you can call on them, perhaps even at the last minute. 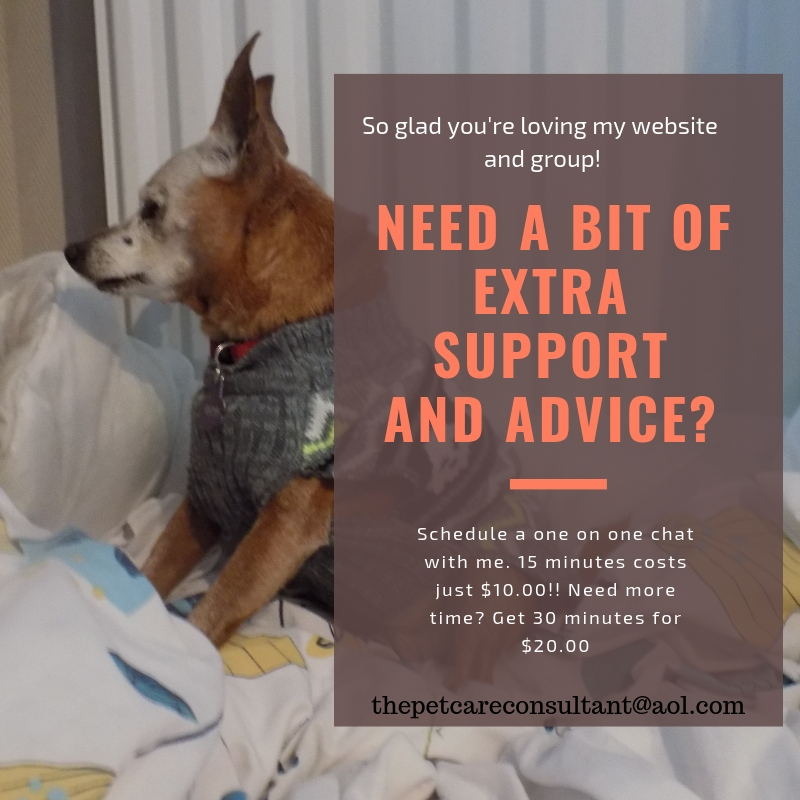 Connecting with a dog walker or two is a good idea, as is checking out day care facilities should you need a safe place for a few hours. Do what you can to stick to their schedule of meal times and exercise. Many old dogs are sensitive to changes in schedule, particularly those with dementia or anxiety for example, and that can be a stressor in itself. If your dog is on medication it is even more important to watch that clock! If at times you need a hand call on that support system. Having said that you need a break, so going for a walk with the dog is a de-stressor for you as well. I know from experience there are times a realtor will call with a last minute request to show your home. Keep a knapsack packed with water, bowls, treats and a favourite toy so you can grab and go. Double check that microchip and tag details are up to date, and have a tag with your new contact details made and ready to use. Start playing a CD of dog calming music now, I mean rightnow…okay when you finish reading!! When you find the ones he relaxes to, those are the ones you will play while packing because it will remind him of the relaxed state he felt. The two that work best for my dog are Through a Dog’s Ear and Relax My Dog. There is a 13 minute sampler of the first on Youtube so you can try before you buy, and the second has hours of free music to play. Through a Dog’s Ear is Red’s favourite! An open house is not a place for a senior dog, or any pet for that matter. If you won’t be hanging either around then no problem, you and your dog can enjoy a day out. If, however, you want to be a part of it call on your support system. Put him in doggie daycare for a couple of hours and see what he thinks. If he likes it you now have a place to take him when you’re busy, or he needs to be out of the house. All the dog stuff should go in a clearly labelled box so when you reach your new home, you can unpack it first and get him settled right away. If possible ask the realtor to come by with buyers during your dog’s walk time. It allows him to stick to his schedule as much as possible, and the less often he sees strangers traipsing through his home the better. Obviously it won’t always be possible, and you certainly don’t want to miss out on a sale, so for those times call on your trusted support system. Pack up your dog’s favourite bed, crate, toys and blankets at the last possible moment. You want him to feel safe and comfortable for as long as possible. If you will be driving to your new home and it’s quite a long distance, I recommend you keep a harness on your dog throughout the trip. If he’s never worn one before, now is the time to start getting him used to it. Rest stops can be hectic and new surroundings frightening, so don’t take a chance of him panicking and slipping out of his collar. You may also want to play that dog calming music during the drive but a word of warning – be careful because it may relax you so much you’ll fall asleep…I’m not kidding. When I play Through a Dog’s Ear for Red, I end up snoozing and that’s on the couch! If you’re moving out of your area, find out where the nearest 24 hour emergency hospital is. I also recommend starting a search for some possible vets you’ll want to check out when you arrive. Having some contact numbers is a wise precaution should your dog be feeling unwell after the journey. Not all tips will be relevant as so much depends on how you’ll be travelling and where you’re going, and as before they are in no particular order. If your senior dog is suffering from anxiety and takes comfort in your presence, try and keep him with you even through the upheaval. Of course you’re the best judge so if you don’t feel it’s a good idea, reach out to one of your support group until you’re ready to go. Even if they just take him for a walk in the neighbourhood it can help keep him calmer. As soon as your start your journey, put the new dog tag on the collar. Until you reach your destination I would leave both of them. I prefer laser engraving as the letters and numbers are a lot clearer than regular engraving, and they last longer. 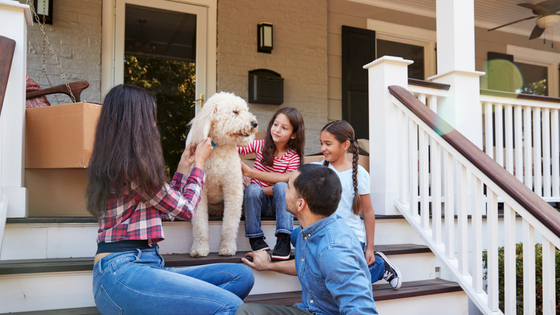 It would be wonderful if you could keep to your dog’s schedule during the actual move, but depending on how you’re getting to your new home, that may not be possible. If you’re driving you could plan rest stops around the same time as feeding and walking times, but no one can expect you to be bang on schedule. 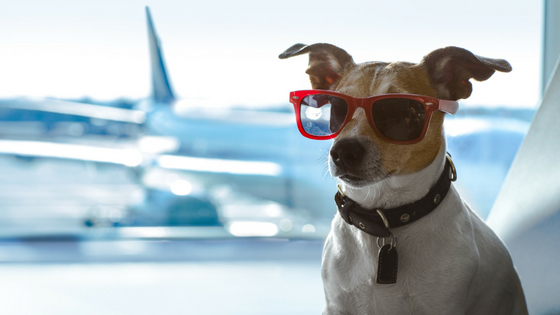 Of course if you’re flying, especially if your dog is in cargo, that just won’t be possible. Have one person responsible for watching the dog when the movers are there. Not possible? Put him in a crate in a room no one has to go into. If a crate is not an option, ask a neighbour if you can bring him over or put him in doggie daycare for a few hours. Some rest stops are crazy busy, but if you have to stop for gas you have to stop for gas. Some turn offs are quiet areas with nothing but a bathroom if that, so aim to stop there when it’s time to feed and walk the dogs. If “busy” is the only option, park as far away from other cars as possible, and try and find a quiet spot. Make sure the harness is on and do the best you can! Have his favourite bed, blanket and a couple of toys with him in the car. If he’s flying, you can put his blanket in the crate. Keep your dog well hydrated throughout the journey. If he’s flying in cargo, half fill the water container then freeze it. Staff will add water before the crate is loaded onto the plane, so the melting ice should give him enough to drink during the flight. Don’t forget car safety whether that means a crate, carrier/travel bag or seatbelt. If the weather will be cold, don’t forget to pack him a sweater and coat. Some cuddle time is definitely in order during the car ride, so you may have to spend time in the back seat with him. Exciting! Overwhelming! Where do I even begin! Perfectly natural reactions when entering your new home. Don’t worry everything will fall into place. Your dog’s routine and schedule resume the minute you walk through the door. He may be in unfamiliar surroundings, but at least his schedule will be familiar. I don’t recommend you give your dog free access in your new home right away. It’s unfamiliar, strange and can be unnerving. Accidents in the house are not a good start, and with the door opening and closing he can easily get out and lost in a new neighbourhood, never mind country. Keep him with you, on a leash, until things settle, and he will feel comforted being close to you. When you have to go out, block off your dog’s area until he has settled in. The smaller space will help him feel safer. If he’s been crate trained even better. What about leaving the crate out with the door open so he has a hidey hole to escape to! Don’t wash the dog’s blankets quite yet. Familiar smells may put him at ease and help him settle faster. I’m stating the obvious by saying if he’s peed all over it/them, this suggestion doesn’t apply!! Resist the urge to throw a housewarming party right away, or spend evenings out establishing a social life. Of course you want to settle in and make friends, just be sure to spend time with your dog as well. When first walking in your new neighbourhood aim for quiet times at first. If you live in the heart of a very busy city there’s not a lot you can do, unless you find a less busy time of day. Use the harness!! Keep doing the activities your dog loved! If you used to enjoy going to a local café and sitting together outside watching the world go by, keep up that fun tradition. Avoid doing the things your dog hates right away. For example, if he hates taking a bath, don’t throw him (I don’t mean that literally!!) into the tub on your first day in the new home. That’s bound to cause tons of anxiety, and maybe even create negative associations. Be mindful about leaving him out in the yard alone while still getting settled, unless there’s no way he can get out. Some dogs may try and escape back to their old homes, even if they don’t yet realise they’re in a different country!! If possible, try not to go back to work or start your new job the next day. Help your senior adjust, and especially if he has dementia, he’ll be even more confused if left alone in a totally strange environment. I may have mentioned some of these stress busting tips above, but I wanted to create this section specifically to highlight some of the options you have to choose from. Not every suggestion will work for every dog, it’s likely going to be a case of trial and error. There are medications your vet can prescribe to take the edge off, but sometimes you have to play around with dosages until it works. It goes without saying, although I’m going to say it anyway, don’t do that without guidance from your vet. When my senior dog Red started pacing and not settling for hours, and before I realised it was dementia, I was struggling to find something to calm her down. I discovered a cd called Through a Dog’s Ear, and it was remarkable. Within seconds of playing it she would relax and fall asleep. It is engineered to help relax anxious dogs, no matter the cause, and it’s absolutely worth a try. There is a 13 minute sampler on Youtube so you can see if it works before you buy. The second thing I tried for her was called Relax My Dog, again on Youtube and there are several to choose from. Some of them last for hours so you don’t have to spend a dime. A word of caution – if you’re playing it in the car, be careful it doesn’t make you drowsy. When I play Through a Dog’s Ear for Red I usually end up having a snooze it’s so relaxing, but I’m on the couch so there’s no worry. Naturally calming, there are several products that mimic those produced by animals, and they are available as plug in diffusers, sprays, wipes and collars. A Bach Flower remedy, it is used for animals who are fearful, anxious or have been through a traumatic experience. Three or four drops in your dog’s drinking water or a couple directly on his tongue is what’s recommended. Do your research to determine what’s best for your pup. Easy to administer, I’ve used Valerian for my senior. A combination of Skullcap and Valerian is even more soothing. Massage can go a long way to calm an anxious dog, and the great thing is it can be done anywhere anytime. My dog Jack loves a good massage, and after a few slow and gentle motions he’s fighting to keep his eyes open. An anti anxiety wrap, the Thundershirt is a tight fitting garment that wraps around your dog’s body and calms him, much like swaddling does for a baby. I have done my fair share of moving with dogs and cats, all seniors with the exception of one dog. Twice I moved to a new home in the same city, so it was as simple as putting them in the car for the short drive. Once it was a drive to Spain from England with two dogs, one of them my golden oldie Red. Mostly it’s been animals flying in cargo. When rehoming isn’t an option, you do the best you can to make their journey as stress free as possible. Will there be an adjustment period? Of course, and don’t be surprised if your dog seems out of sorts for a few days, and that includes being off his food. If this persists, or something doesn’t seem right, please take him to the vet. Oh yes, my pets (cats and dog) can sense when something is up! Like going to the vet! 🙂 Great tips and advice here. I like how you point out to pack a separate bag and show what to include as well. I’ve never thought of playing calming music, too. What a great idea! I know what you mean Rachel, they always know when they’re going to the vet as well!! Glad you found the tips helpful. Ugh, I agree – moving is so stressful. We moved a few years ago and it was the only time we ever brought our dog to a daycare. It was so helpful to know she was somewhere safe, where she would get attention while we packed and tried to sell the house. I was also less worried about doors being left open as items were transported back and forth. Great tips here – super thorough. It really is terribly stressful on its own, but worrying about doors opening and constantly looking for the dogs becomes too much. Having them go to daycare or a trusted friend or family member can really help reduce the anxiety. Thanks Ruth. It sounds like Layla has tons of friends, so you’re fortunate to always have someone to step in and care for her when needed. She’s a lucky pup! This is a lot of great advice! SOme of it applies even to smaller “moves” like going on vacation, which can also be stressful…. Thanks and you’re absolutely right. I do believe a lot of the tips can help any situation where there is some upheaval involved. I haven’t moved with Mr. N yet but he’s constantly going to new places and adjusts fine to hotel rooms and such so I think he would be OK. Good tips for making sure everything goes smoothly! Thanks, glad you found the tips helpful. I imagine all the new adventures and places Mr N is exposed to makes him a lot more adaptable. These moving tips are all great! 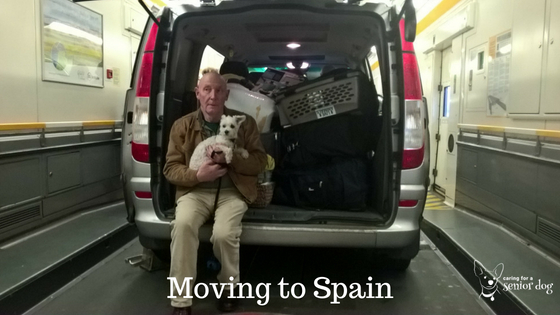 I did a post on moving with pets as well – we will be moving again next year and I’ll keep both my own tips and these handy. We moved 2 years ago across the U.S. and I gave lots of thought to how to handle the dogs during our home sale and move. We ended up using a Pack Rat container (it’s just like PODs) and took our time loading it up. Towards the end, before listing the house, we all drove cross country. Then my husband flew back and listed the house for sale and stayed for a couple of weeks while it was being shown and closed. Thankfully it sold and closed very quickly. It was a very smooth process for everyone, for the most part thanks to lots of discussion and planning on how to handle the pets! Thanks Cathy and glad to hear everything went so smoothly. Like you said, it’s down to a lot of discussing and planning, keeping the pets in mind throughout. Good luck on your next move! 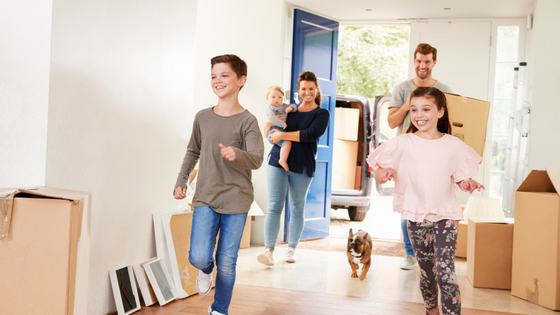 Moving can be very stressful, especially with pets or small children! These seem like great suggestions to reduce the stress on a senior dog as well as the humans. My dad was in the military so we moved every few years when I was a kid. The first day we saw the new house was always exciting. I loved watching the dogs run from room to room exploring everything too. Thanks Beth, the tips are definitely great for everyone! I imagine as tough as moving around so much as a kid might have been, it would have also been exciting to see new places and meet new people. I can just imagine everyone running through every new house, full of excitement. I’m considering a move in the next couple of years and I dread the thought of trying to sell the house and move with Truffle and Brulee. This is the only home they’ve known since they were 12 weeks old. I’ve moved quite a bit with cats, and I was always amazed at how relatively quickly they would adapt to every new environment. Sure some hid a bit more than others, but basically they got comfortable and settled well. I’m sure it will be an adjustment for Truffle and Brulee, but with some planning it should all go smoothly. Back in my country, we have a saying – “It is better to have your house burn down than to move.” Of course, it doesn’t mean that having the house burn down is a good thing but to illustrate how horrible thing moving is. Fortunately, it seems that all our guys had either been extremely laid back about such things or having that much trust in us – they’ve never been upset about all the commotion and disruption. Even Cookie was completely cool until we started moving HER bed (which we left for the very last). I love that expression!! It pretty much sums up what a nightmare the whole experience can be.